Turn an everyday basket into a pretty petal carrier by covering it with cloth. Flower girls walk down the aisle after the bridesmaids, scattering petals for the bride. The flower girl represents purity and innocence carrying her basket of flower petals. She leaves the path strewn with fragrant flowers as a symbolic path of the bride starting her new life. The flower baskets can be customized to fit with any wedding theme. The baskets can be made from metal or mesh or be silk bags or a regular basket from the store. Cover the basket with material to match your decor and the whimsy of the flower girl will charm the wedding guests. Spray paint a wicker basket to match the colors of the material being used. 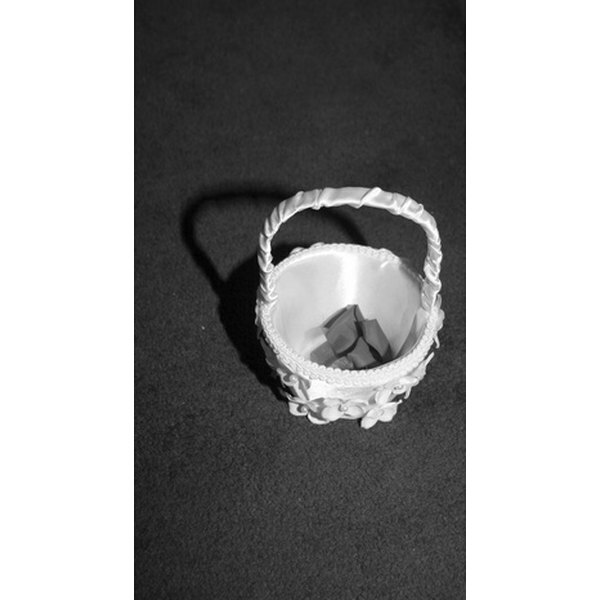 White is frequently used to make the basket match the flower girl's miniature wedding dress. Cut a circle of the cloth you are using to cover the basket. Measure the circle by setting the basket on the material and doubling the circumference of the basket. Set the basket in the middle of the circle and wrap up the sides and over the rim into the bottom of the basket, smoothing as you go. Attach the cloth to the basket using tiny dots of hot glue and pressing into place. Measure and cut another circle to fit the inside of the bottom of the basket. Glue in place covering the seams of the first circle. Place a dot of hot glue to the base of the handle and attach silk ribbon to the handle. Wrap the ribbon around the handle, overlapping the edges as you go. Glue the end of the ribbon to the other side of the handle where it attaches to the basket. Add touches of dried or silk flowers and tulle to the basket as desired. Laurie Durkee has been a freelance writer since 2009. She is published on eHow, where she specializes in gardening, home decorating and home improvement. Durkee attended classes in behavioral science at Southern Maine Community College.